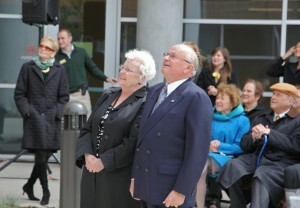 The largest building at UCCS was renamed Thursday morning in honor of its largest donors, Ed and Mary Osborne of Colorado Springs. 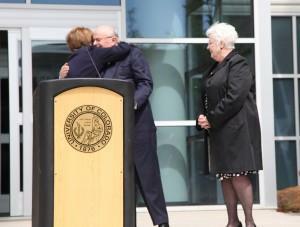 During a 10:30 a.m. outdoor ceremony, the Science & Engineering Building was renamed the Osborne Center for Science and Engineering. The ceremony featured comments by CU President Bruce Benson, UCCS Chancellor Pam Shockley-Zalabak and both Osbornes. But stealing the stage were youngsters from the Family Development Center who performed two songs and presented Mary Osborne with a bouquet. 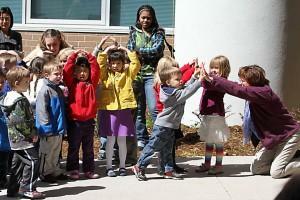 The Family Development Center is one of several campus units benefitting from the Osborne’s generosity. In his comments, Ed Osborne reminisced about coming to UCCS in 1969 and first connecting with Theaterworks, and later the College of Engineering and Applied Science. He cited the names of current and past UCCS faculty members as leaders in their fields before complimenting all faculty and staff for their “common sense approach” to higher education. Mary Osborne shared her experience at a recent commencement ceremony where parents, spouses and children of students were asked to stand and applaud the graduates. “I wanted to stand and cheer,” she told the crowd of about 100 standing in the entryway of the building that will bear her name. 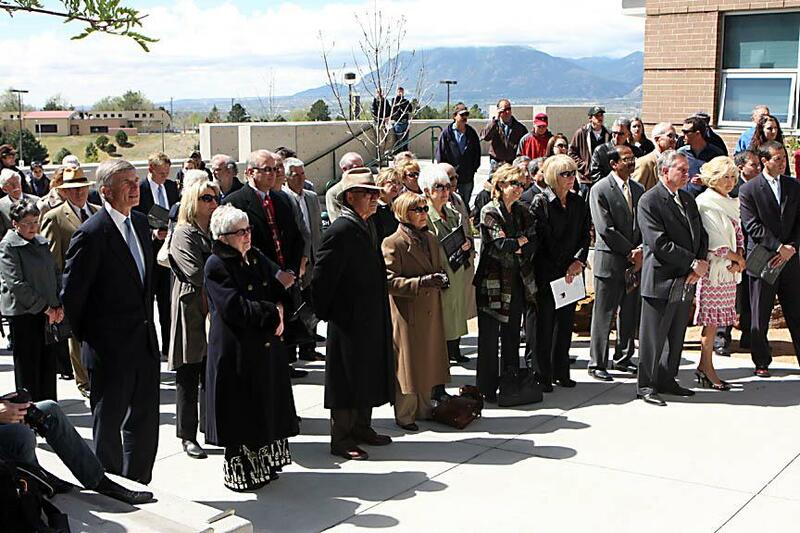 A recent major estate commitment by the Osbornes will support an Osborne Scholarship Fund, the Department of Mechanical and Aerospace Engineering, the CU Aging Center, the Family Development Center, Theatreworks, and general UCCS operating support. 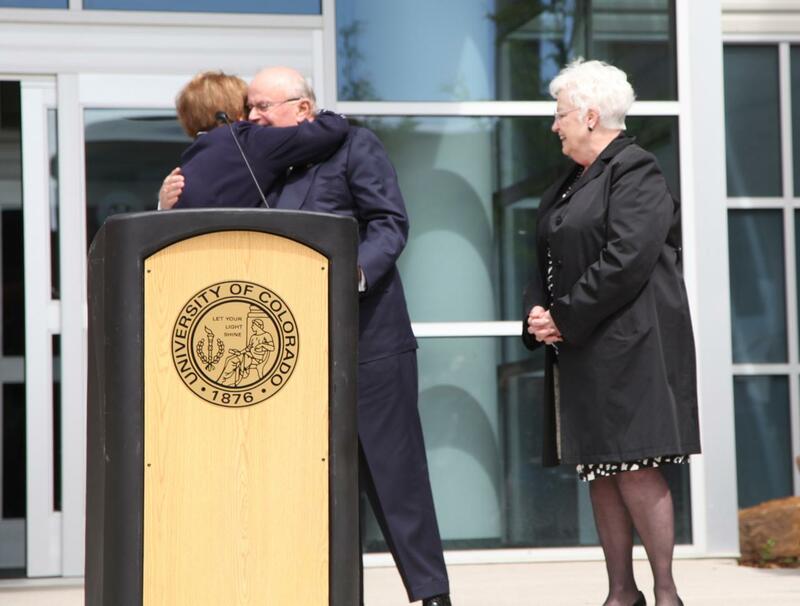 When added to previous Osborne gifts to the campus, the couple’s total giving will exceed $10 million, making them the most generous benefactors in the 46-year history of UCCS. 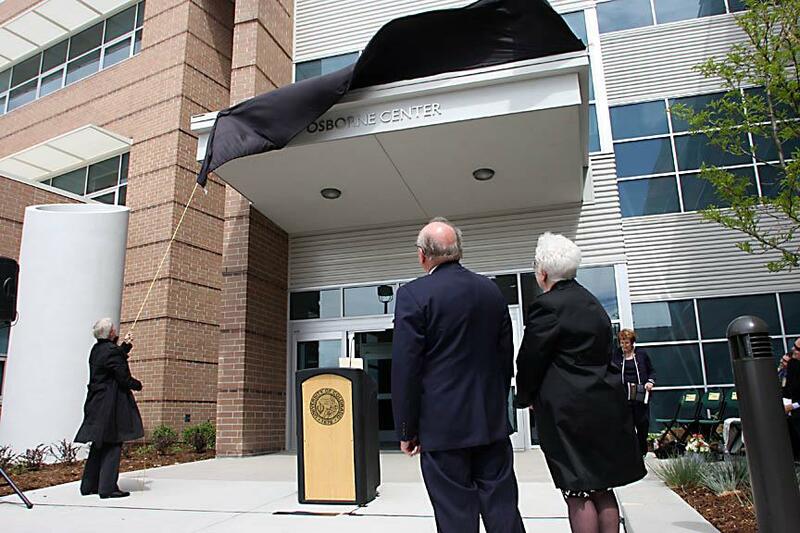 “The Osbornes are special people whose dedication and commitment to UCCS are examples of how donors and the university can transform both today and tomorrow,” said Shockley-Zalabak. The Osbornes were named by Shockley-Zalabak as Creating Futures UCCS campaign chairs not only for their generosity as donors but also their community influence and leadership. They have contributed their time, resources, and ideas to the university since shortly after they arrived in Colorado Springs in 1969. Ed had been a decorated Air Force fighter pilot who taught engineering at the Air Force Academy and was a successful executive. Mary had a pioneering career in the accounting field, retiring as senior partner at Osborne, Parsons, and Rosacker. Each has received prestigious UCCS honors and has served on boards for nonprofits such as Goodwill Industries, Pikes Peak Hospice and Palliative Care, and more. Mary will be the 2011 “Unstoppable Women” honoree at a May 18 lunch benefiting the Karen Possehl Women’s Endowment at UCCS. 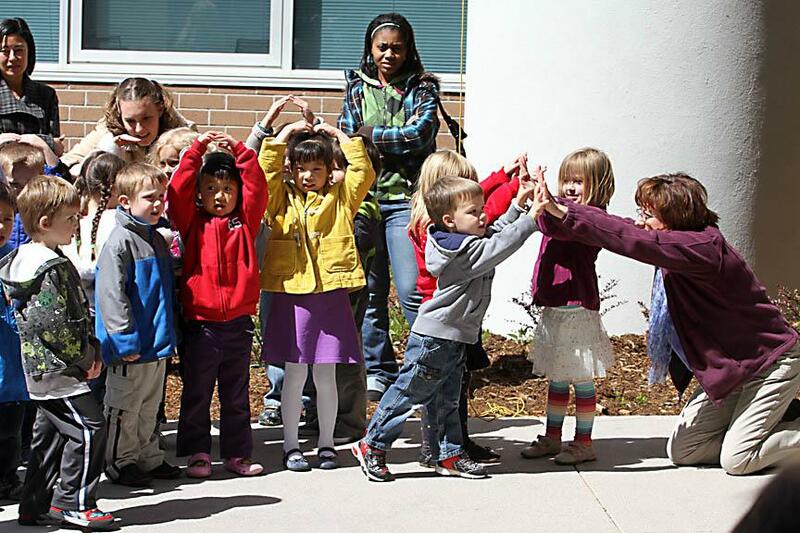 Together, they received the Outstanding Individual Donor award from Partners in Philanthropy for lifetime generosity throughout the Pikes Peak Region in 2002. As co-owner and executive at local aircraft parts manufacturer AMI Industries in the 1980s and ’90s, Ed saw community and industry need for advanced mechanical and aerospace engineering education, and helped launch a UCCS program in this field that first admitted students in 1999. It is now the largest program within the College of Engineering and Applied Science, and Ed continues to serve on its advisory board. The Osbornes first developed their passion for UCCS through their love for theater, and when in 1997 Theatreworks Artistic Director Murray Ross sought to provide an open-air venue for Shakespeare and other productions, they made what Ed calls a “stretch decision” to donate $25,000 to co-purchase the tent with the late Dusty Loo and his wife, Kathy, whom they consider philanthropic mentors. The Osbornes’ philanthropy connects strongly with the priorities of the Creating Futures campaign, whose $1.5 billion goal is the most ambitious in CU history. Student scholarships are high on their list: they particularly commend UCCS’s Bruce and Anne Shepard Reach Your Peak Scholars program, which has supported more than 1,000 students, many of whom would not otherwise have been able to attend college, since it began in 2000. They also recognize the need for unrestricted support that gives the university latitude to apply funds where needed most. Such unrestricted support is critical as CU aims to keep tuition manageable despite declining state funding for higher education: Colorado ranks 48th in the U.S. in state support per resident student. 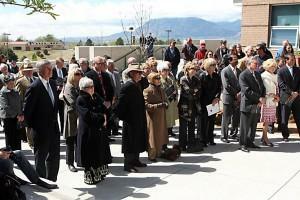 As campaign leaders and ambassadors, the Osbornes want to widen the pool of UCCS supporters. “Even for our young graduates, if they can just give $25 or $50 toward something like the Reach Your Peak program, that gift can be bundled toward a specific gift to a specific student, and they’ll be able to see the impact and know they helped somebody,” Ed says.